The slope on the Sampson Creek Preserve where the monarch butterfly habitat project will be placed. Mt. Ashland is in the background. (L to R) Robert Coffan (Southern Oregon Monarch Advocates), Maia Black (Selberg Institute) and Sean Prive (Lomataksi) examine some wildflowers on the Sampson Creek Perserve. Silvery Blue butterflies stop for a drink at a muddy puddle on the Sampson Creek Preserve. Maia Black of the Selberg Institute points out some milkweed plants being cultivated to supply plants for the planned monarch butterfly habitat project on the Sampson Creek Preserve. You recognize monarch butterflies; with their large, distinctively patterned orange, black and white wings, monarchs are iconic across North America for their far-ranging multi-generational migration. The population of these colorful creatures has plummeted by 75 percent or more since the 1990s. Now, government agencies and local non-profits are teaming up to restore feeding and breeding habitat for the monarchs as they make their way through southern Oregon each year. Jefferson Public Radio’s Liam Moriarty recently took a tour of some of the projects intended to help bring these crowd-pleasing creatures back from the brink. Carder is with the Lomakatsi Restoration Project, an Ashland-based non-profit that does forest health and habitat restoration projects in southern Oregon and northern California. Lomakatsi has worked with community members and students at a local elementary school to plant these waystations to provide tiny oases for bees, birds and other pollinating species. Monarch butterflies rely on milkweed. It’s where they lay their eggs, and it provides essential nutrition for monarch larvae. Carder says pollinator habitat – and milkweed in particular – has been widely displaced by human development. “A lot of times milkweed was growing in places where people wanted to build houses or where there were places that were good for farming or things like that and they were oftentimes seen as weeds,” she says. I’m bouncing along a deeply-rutted dirt road in an All-Terrain Vehicle driven by Maia Black. Black heads the Selberg Institute, that manages this 4,800-acre former cattle ranch along Sampson Creek south of Ashland. As we follow the creek upstream, she slows the ATV to point out new plantings of milkweed and other pollinator-friendly plants. “Wherever you’re seeing these orange stakes along the drive is where we’ve kind of selected little planting sites based on exposure to sun or proximity to the creek,” she says. After climbing a while, we emerge in a saddle between grassy hills, with the Siskiyou Mountains stretching off to the south and west. Here, Black points out over the 30-acre site where a large-scale monarch habitat restoration project will soon be underway. We’re joined by Sean Prive, an ecologist with Lomakatsi. Prive says the plan is to try to restore the natural diversity that would have existed on this site before decades of cattle grazing changed the plant community. The first step is a controlled burn. Then, native seed and seedlings will be planted. With any luck, after a few years, Prive says, native wildflowers will produce nectar to feed a variety of pollinators, especially monarchs. “The milkweeds in particular produce food for the monarch larvae, which hatch nearby and then consume the milkweed before they turn into butterflies and continue on their migration,” he says. This site is one of six that are being restored for monarchs across southern Oregon, totaling 300 acres from the Coast Range in Curry County to the Siskiyous along the California border. Robert Coffan -- with Southern Oregon Monarch Advocates -- says these landscape-scale habitat projects represent an ambitious leap from the tiny pollinator waystations. And, he says, they’re part of a new way of thinking. 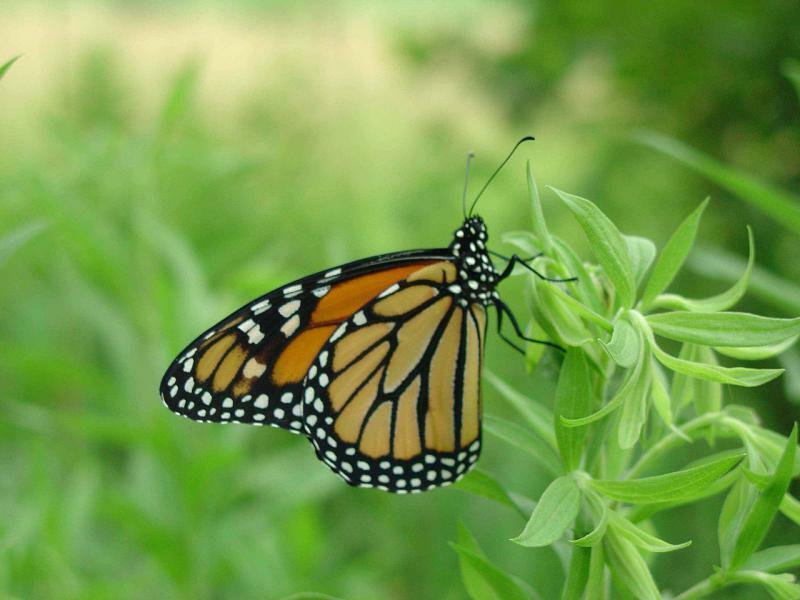 If these initial projects are proven to create usable monarch habitat over the next few years, Coffan says, projects of this type could well become more common as ways to throw a lifeline to the region’s iconic pollinators.